I get a lot of questions from aspiring makeup artists on tips, tricks, techniques and advice to help them get started. I've been wanting to do this series for a while to show you all some things I've learned along the way. The next installment in the series will focus on Makeup Artist Chairs. Today I will be featuring traincases. These are essential for traveling makeup artists or even for those who are looking to store makeup. In the video, I go over the benefits and purposes of a traincase, qualities you'll want to look for, as well as show you my collection of traincases. I'm a huge nerd when it comes to researching a product. After hours of internet searching, I found that http://www.yazmo.com/ was the best resource for finding a huge assortment of professional makeup traincases at a decent price. This is after comparing prices on various price finder sites and intense googling. Use the code renren to get 10% off your total order! Lastly, all orders over $99 (which are most of the nicer traincases) get a free 9 piece brush set! Make sure to check out the video if you are an aspiring makeup artist or if you're in the market for a new traincase. 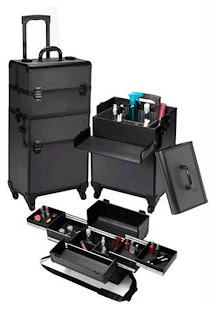 I'm currently in love with the Pro Aluminum Makeup Case All Black 4 Wheeled Spinner TS-88A. It's the newest model and seems to combine all of the best qualities of my former traincases into one. This LIMITED EDITION professional makeup case is equipped to store all your makeup, accessories, and more! This cosmetic case features an all NEW 360 degree, fully mobile, easy to transport rolling system. When you're on the go, this stylish makeup case is the solution. This makeup case separates into two sections, with an additional lid that turns the bottom section into its own rolling makeup case. Also included is an ergonomic shoulder strap that turns the top section into a carrying makeup case, for those smaller jobs. This makeup case comes with a high end lock and key system to keep your makeup secure, four roomy slide out trays with padded vinyl lining, a removable tray with adjustable/removable dividers, and a retractable handle for easy rolling. This is a must have for any professional makeup artist! Take it on your next trip, next job, or let it become a fixture in your bathroom or bedroom. The sleek all black finish is sure to attract attention and turn heads. Buy this ultimate cosmetic case while supplies last. -Of course I love how it has all 4 wheels so it can be spun 360 degrees. This makes it easier to navigate and twist and turn in tight places. Also, you don't have to worry about dragging it at a 45 degree angle which places all of the weight on your arm. Instead, you can just keep it upright on 4 wheels and push it...so much lighter! -I like the padded, vinyl lined trays. They look nicer and cushion makeup more when you travel. -The sleek black finish makes it look super professional and very chic. -Holds a lot of makeup! -the trays on the top portion of the traincase could pull out a little farther in my opinion, I don't like when you have to reach under the tray to reach items in the tray below it. To see previous videos of my other traincases, click here. I hope you guys enjoyed my first installment in this series. Stay tuned for more! haha, i was JUST about to ask you your opinions on traincases!! i've been searching on Yazmo lately and i came across this one -- now i know it's worth it!! =] thank youuuuu! omg i love this thing. i will get it one day. oh yes... i will. Thanks for posting! I used the coupon and got a nice red case for my bathroom.